Interstate 580 overlays the U.S. 395 freeway in western Nevada between Fairview Drive in Carson City and Interstate 80 in Reno. Completion of the freeway through Washoe Valley connected the Nevada capital city to the Interstate system for the fist time. I-580 serves both through traffic and commuters, varying between urban stretches through Reno and Carson City, and hugging the eastern slopes of Steamboat Hills to the Galena Creek concrete arch bridge overlooking Pleasant Valley. Opened at 10 AM on August 2, 2017,8 the 3.146 mile link from Fairview Drive (Exit 38) south to U.S. 50 and 395 at South Carson Street completed the 35-mile Interstate. Exit numbers along I-580 use U.S. 395 mileposts, counting up from the California state line at Topaz Lake. Interstate 580 in Nevada is part of High Priority Corridor 68: Washoe County Corridor and U.S. 95 Las Vegas to Reno Corridor. 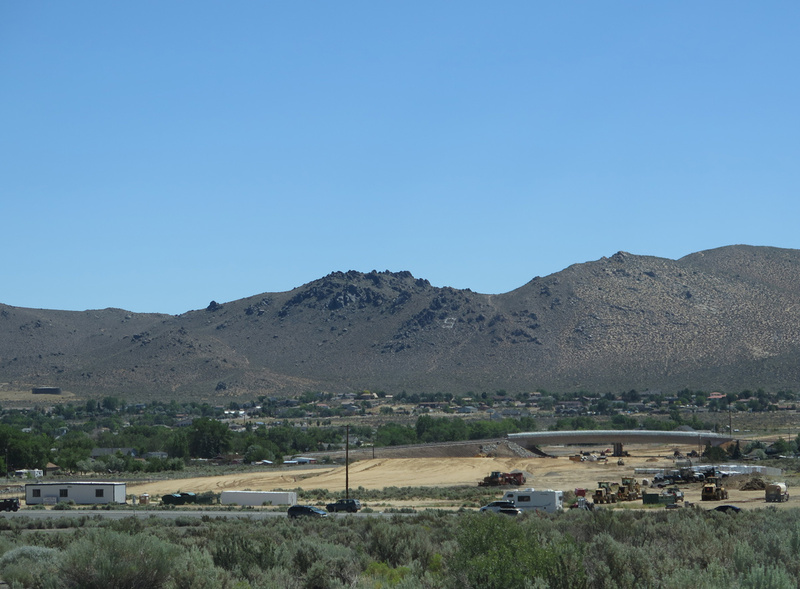 The signing of Interstate 580 varied over the decades leading up to 2012, when the route was fully signed along U.S. 395 from Carson City northward. Prior to that time, the route was unmarked and only acknowledged on NDOT mileposts along the Martin Luther King, Jr. Memorial Highway through Reno as IR 580. A short stretch of Interstate 580 was opened to traffic from I-80 south to Villanova Drive in 1980. U.S. 395 temporary shifted to Kietzke Lane (SR 667) to continue south to Virginia Street. The unsigned route was sometimes shown as “Spur I-580” on 1980s road maps. With the completion of the Galena Creek/Pleasant Valley Bypass in August 2012, the route from U.S. 50 (Williams Street) in Carson City north to Reno was designated as Interstate 580, with signs installed throughout the route by October 2012. The lone exception was the segment of the Carson City Freeway spurring south to Fairview Drive. 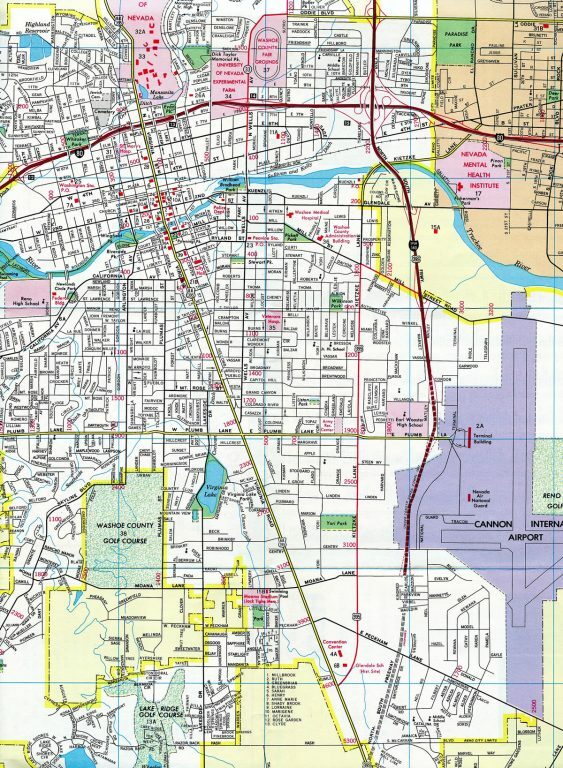 NDOT listed that portion officially as a part of IR580, but signed it solely as U.S. 50. With completion of Phase 2B-2 south from Fairview Drive to South Carson Street, I-580 was fully signed south of Williams Street. A milepost incorrectly identified U.S. 395 at Panther Valley as part of Interstate 580. 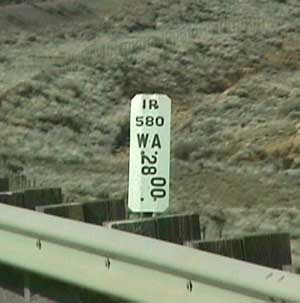 Prior to 2012, the NDOT mileposts were the only indication that U.S. 395 through Reno was also I-580. As is standard in Nevada, these white mileposts indicate the type of route (IR means Interstate), route number (580), mileage (distance north from the county line), and county (WA means Washoe County). The design is the same that Caltrans uses. Photo taken by Mike Ballard (06/98). 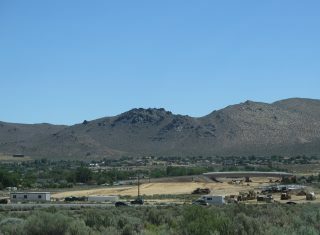 Construction for Interstate 580 at Snyder Avenue in south Carson City. Phase 2B-2 construction of the Carson City Freeway included the grade separated crossing at Snyder Avenue. This work was completed from early 2013 to summer of 2013.6 Photo taken 06/21/14. Despite being unsigned, Interstate 580 appeared on the Rand McNally North American Road atlas throughout the 1980s editions. A community free fun walk, run and ride celebrated the opening of the last leg of the Carson City Freeway on July 22, 2017. The $42.24 million7 section opened to motorists on August 2. Spanning 2nd Street with seven northbound lanes, Interstate 580 & U.S. 395 make their final approach to Interstate 80 (Exits 68B/A). Photo taken 06/28/14. A lane drop occurs as I-580 & U.S. 395 cross over the Truckee River and Kietzke Lane (SR 667). Traffic partitions nearby with two lanes departing for Interstate 80 east through Sparks. A subsequent two-lane ramp (Exit 68B) follows for I-80 west to Verdi. Photo taken 06/28/14. East from I-580 through Sparks, Interstate 80 constitutes a six-lane freeway to Rock Boulevard, with auxiliary lanes accompanying the route to the east Truckee Meadows industrial area. Photo taken 06/28/14. A two lane loop ramp carries motorists onto Interstate 80 west toward Sacramento, California as part of the turbine style interchange joining the two freeways. I-580 ends as U.S. 395 continues north to Panther Valley, Bordertown and Susanville, California. Photo taken 06/28/14. U.S. 395 leads south one half mile from the parclo interchange (Exit 69) with Oddie Boulevard to the systems interchange with I-80 and the southbound beginning of Interstate 580. Photo taken 06/28/14. All traffic for Interstate 80 west to Truckee and Sacramento, California and east to Fernley and Elko depart in unison from U.S. 395 (Martin Luther King, Jr. Memorial Highway). Interstate 580 & U.S. 395 shift southeast from Exit 68 to pass east of Downtown Reno and west of Reno / Tahoe International Airport (RNO). Photo taken 06/28/14. Auxiliary lanes in each direction of Interstate 80 expand the freeway to eight overall lanes between Wells Avenue (Exit 14) and Interstate 580 & U.S. 395 (Exit 15). Photo taken 08/04/13. 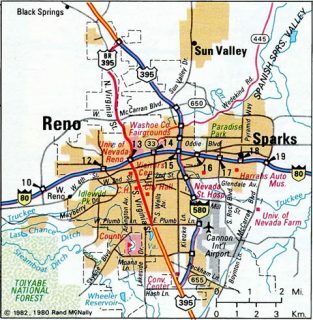 Traffic partitions with two lanes joining Interstate 580 & U.S. 395 south to Washoe Valley and Carson City and U.S. 395 extending north to Stead and Cold Spring in north Reno. Photo taken 06/28/14. Interstate 580 accompanies U.S. 395 south through Reno, paralleling Virginia Street (U.S. 395 Business / U.S. 395 Alternate) from near Downtown to Pleasant Valley. The U.S. 395 freeway continues 23 miles north to California 70 at Halellujah Junction. Photo taken 08/04/13. Interstate 80 east at Exit 67 for U.S. 395 and then-unsigned Interstate 580 south. Reconstruction of I-80 added a fourth eastbound lane and sound walls. Photo taken by Chris Elbert (03/19/05). Non-reflective signs previously partitioned traffic at Exit 15 for U.S. 395. The southbound ramp to I-580 splits here with two lanes initially now, but tapers to one before merging onto U.S. 395 ahead of the Truckee River. Photo taken by Chris Elbert (03/19/05). Interstate 80 shifts northward across the Reno / Sparks city line over 4th Street / Prater Way (Business Loop I-80) just ahead of the turbine style interchange (Exit 15) with Interstate 580 south and U.S. 395 (Martin Luther King, Jr. Memorial Highway). Photo taken 06/28/14. Exit 15 separates from the I-80 westbound mainline as a distributor roadway, taking commuters from both the freeway and Prater Way below to Interstate 580 and U.S. 395. Photo taken 06/28/14. With traffic joining the ramp to I-580 and U.S. 395 from Prater Way, a pair of overheads direct motorists south to Reno / Tahoe International Airport (RNO) and the capital city and north to Susanville, county seat of Lassen County, California. Photo taken 06/28/14. An interchange sequence sign references the south end of the Carson City Freeway, where U.S. 50 west and 395 south split for Lake Tahoe and Minden respectively. This sign stands just north of the Clearview Drive overpass. Photo taken 07/17/17. Interstate 580 & U.S. 50-395 curves west to pass below Nevada 526 (Snyder Avenue) to U.S. 395 Business (South Carson Street). A SPUI will replace the at-grade intersection with South Carson Street in the future. Photo taken 07/17/17. U.S. 50 advances from I-580 and U.S. 395 to traverse the Carson Range west to Spooner Junction (SR 28) and Lake Tahoe. U.S. 395 overtakes South Carson Street from U.S. 395 Business along an arterial route to Douglas County and Carson Valley. Photo taken 07/17/17. U.S. 50 lowers from the Carson Range along an expressway extending east from Spooner Junction to tie into Interstate 580 (Carson City Freeway) directly at U.S. 395 (South Carson Street). Photo taken 07/17/17. U.S. 395 enters Carson City and Eagle Valley from Gardnerville and Minden in the south Carson Valley. U.S. 395 Business follows the pre-freeway route (Carson Street) north to the State Capitol and Downtown Carson City. Photo taken 07/17/17. U.S. 395 heads north from Topsy Lane to enter the Carson City limits just ahead of Clear Creek Road, U.S. 50 west and Interstate 580 north. Photo taken 07/17/17. An east side frontage road serves a mobile home park and storage facility while big box retail lines the west side of U.S. 395 to the at-grade intersection with U.S. 50 west to Lake Tahoe and Interstate 580 (Carson City Freeway) north to Reno. Photo taken 07/17/17. U.S. 50 east & 395 north overlap with I-580 north to bypass Carson City as Carson Street becomes U.S. 395 Business north to Downtown. AASHTO approved a Nevada application to designate U.S. 50 Business along South Carson Street and William Street on May 15, 2009. However NDOT never signed the bannered route. Photo taken 07/17/17. South Carson Street comprises a six-lane commercial arterial from Fairview Drive (former Temporary U.S. 50) to Interstate 580, U.S. 50 and U.S. 395. Photo taken 07/17/17. A left-hand turn lane joins the south end of U.S. 395 Business (South Carson Street) with the northbound beginning of I-580. U.S. 50 east & 395 north overlap with the Carson City Freeway to bypass Downtown. Photo taken 07/17/17. Billeci, Dave. Personal Email, “A I-580 NEVADA FACTOID” from March 23, 2006. Spring 2012 Applications for AASHTO Special Committee on Route Numbering. Project History and Overview, http://www.freewayextension.com I-580 Extension Project web site. "Community invited to fun run/walk event to celebrate Carson City freeway opening." Northern Nevada Business Weekly, July 6, 2017. "Work nears completion on Reno-Carson freeway." Associated Press State Wire: Nevada (NV), May 29, 2012. Nevada Department of Transportation : I-580 / U.S. 395, https://www.nevadadot.com/projects-programs/road-projects/carson-city-freeway NDOT project web site. "Carson City Bypass to open first week in August." Nevada Appeal (Carson City, NV), June 17, 2017. "New freeway to save drivers time in Carson City." KOLO 8 (Carson City, NV), August 2, 2017. Page updated August 5, 2017.